The Blues were dealt their worst ever Premier League defeat at the Etihad Stadium, and it followed a 4-0 hiding by Bournemouth in their previous away game too. It’s certainly not been the most impressive start to life at Stamford Bridge by Sarri, who joined from Napoli in the summer. 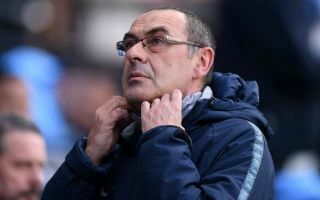 Chelsea managers don’t tend to get long to put things right, and the Telegraph now report that the Italian tactician’s fate could be decided in the next couple of weeks, with the team’s progress in the Europa League crucial. This makes sense as Chelsea now look increasingly likely to need a win in the Europa League to get them back into the Champions League next season. CFC’s heavy defeat to City means they now sit behind Arsenal on goal difference, while in-form Manchester United have moved a point ahead of them in fourth spot. Antonio Conte was sacked after Chelsea finished 5th last season, so one imagines Sarri is under big pressure to improve on that and get the west London club back to Europe’s top table.